The Emperor penguin Aptenodytes forsteriis is the only penguin that inhabits the Antarctic continent. Emperors are the largest of all penguins, easily recognised by their black cap, blue-grey neck, orange ear-patches and bills and yellow breasts. There is a thick layer of blubber under the Emperor's skin which is covered by a dense layer of woolly down. An overlapping coat of feathers grows over this layer. The outer feathers are covered in a greasy waterproof coating. 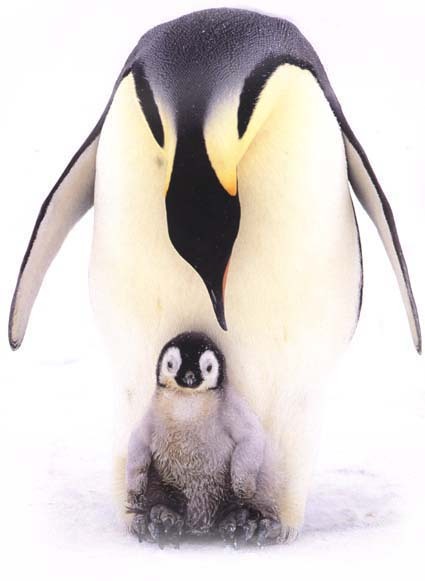 The Emperor penguin grows to around 115 cm. It weighs 25-40 kilograms, but male weight can vary by up to half that amount depending on the length of breeding. Males and females are indistinguishable during most of the year. However, when it becomes time for the male to switch responsibilities with the female, the male can have slimmed down to half her weight. Over forty colonies are known, ranging in size from less than 200 pairs in the Dion Islands to over 50,000 pairs on Coulman Island. Perhaps 200,000 stable breeding pairs can be found on the Antarctic ice shelves. The Emperor penguin feeds primarily on shoaling fish, small crustaceans and squid. They can dive more than 300 metres deep, and remain under water for as long as 20 minutes. Emperor penguins breed on level, stable sea ice. Only two colonies are known on land. The female lays only one egg; it is too energetically expensive to rear more than one chick. Emperors assemble at the breeding colonies early in winter, shortly after the sea ice has formed. They breed during the perpetual darkness of the Antarctic winter, gathering at rookeries up to 90 kilometers inland during the months of April and May. After the female lays her egg, she immediately passes it over to the male. The female travels across the ice to feed in the fish-filled waters far away in the north. She spends the winter at sea. At the beginning of September, the young are hatched. When the chicks finally emerge, they are very hungry. The females return to the colonies seven to eight weeks after laying to relieve their mates and tend the newly hatched chicks. If the female hasn't yet arrived, the father regurgitates a white secretion and feeds it to his chick. The chicks huddle together: the climate is extremely harsh. Winter temperatures may fall below -60C. Wind velocities can reach 180km per hour. But inside the huddles, the temperature can be as high as 20°C above ambient conditions. Adults recognize and feed only their own chicks. Parents are able to identify their young by their chick's distinctive call. The contact call of emperor penguins can be heard up to a kilometer away. Chicks grow slowly at first, more rapidly in late spring. Once the young are about seven weeks old, they join other chicks in a crèche, which is protected by a few adults. By midsummer, they are independent. They will be ready to breed in 4-8 years. Giant petrels prey upon eggs and chicks, whereas at sea their predators are orcas and leopard seals. 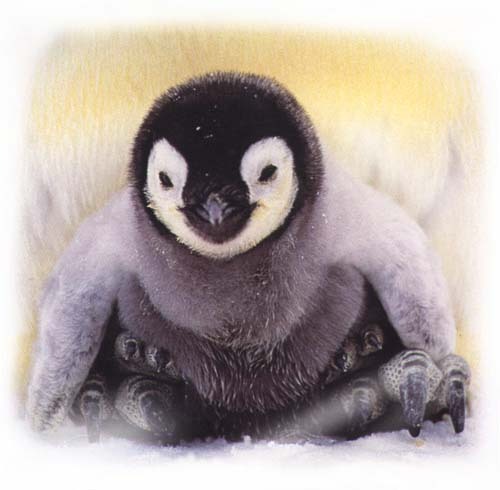 Emperor penguins can live up to twenty years or more, but mortality among the infant chicks is high.